The global on-the-go breakfast packaging market is characterized by a high degree of fragmentation with a large number of small and medium-sized companies, which renders an intense competitive scenario. In order to survive the cut-throat competition, savvy players are engaged in broadening their product portfolio range for a single product to cater to the different requirements of consumers. Some of the key growth drivers in the global on-the-go breakfast packaging market are increasing trend of consumption of convenience foods, rising trend of single households, increasing expenditure on prepared foods, and a large number of women in the workforce. Apart from this, rising health claims of manufacturers of on-the-go breakfast foods about additional health benefits, especially the organic variants is bolstering the demand for food packaging solutions. A report by Transparency Market Research says that the global on-the-go breakfast packaging market will likely rise at a CAGR of 5.1% for the forecast period between 2017 and 2025. Expanding at this rate, the revenue of this market is projected to become US$1.1 bn by 2025 from US$743 mn in 2016. The global on-the-go breakfast packaging market is divided into rigid packaging and flexible packaging based upon packaging type. The segment of flexible packaging accounts for a leading share in the market in terms of value. The major factor driving the flexible packaging segment is consumer preference for convenient packaging solutions. Flexible packaging is expected to rise at a CAGR of 5.5% over the forecast period. The segments of the global on-the-go breakfast packaging market on the basis of material type are plastic, paper, and others. Of them, the segment of plastic is expected to dominate accounting for a phenomenal 56.1% of the market by the end of 2017. On the other hand, the segment of paper is expected to display the leading CAGR of 5.6% over the forecast period between 2017 and 2025. The global on-the-go breakfast packaging market by breakfast products is classified into cereal meals, breakfast bars, sandwiches and burgers, sausages and salamis, cakes and muffins, egg meals, milkshakes and juice, and others. The segment of sandwiches and burgers account for the leading share in the global on-the-go breakfast packaging market. The segment of milkshakes and juices is expected to hold the second-leading share in the market over the forecast period. From a geographical perspective, Europe tops the global on-the-go breakfast packaging market in terms of market share. The supremacy of the region is on the back of a large urban population and a large number of women in the workforce that consume prepared foods for convenience. However, Asia Pacific is expected to display the leading CAGR of 5.3% for the forecast period between 2017 and 2025. A large proportion of population in working age in developing countries such as India that prefer consuming on-the-go breakfast is the key factor behind the robust growth of this regiobal market. Key players in the global on-the-go breakfast packaging market include Amcor Limited, Berry Global Inc., Sealed Air Corporation, Bemis Co. Inc., Huhtamaki OYJ, Winpak Ltd., Mondi Group, DS Smith plc, International Paper Company, Sonoco Products Company, Smurfit Kappa Group Plc, Tetra Pak International S.A, Coveris Holdings S.A, Georgia-Pacific LLC, Linpac Packaging Ltd., Constantia Flexibles Group GmbH, Reynolds Group Holdings Ltd, WestRock Company, Ampac Holdings LLC, and Clondalkin Group Holdings B.V. The concept of on the go breakfast has been developing with increment in accessibility of packaged food and refreshments. Quick paced way of life of the consumers have moved their inclination towards readymade food items over traditional partners. Simple accessibility of such items over all channels and less time for food handling are a portion of the central point driving the interest for on the go breakfast items at introduce. Besides, expanding wellbeing mindfulness and changing dietary patterns of the consumers has enlarged the interest for on the go breakfast items. Low mindfulness among the consumers in a large portion of the rising economies and immature economies is as of now controlling the development of the market. Nonetheless, effect of limitations is required to decrease in the coming years. 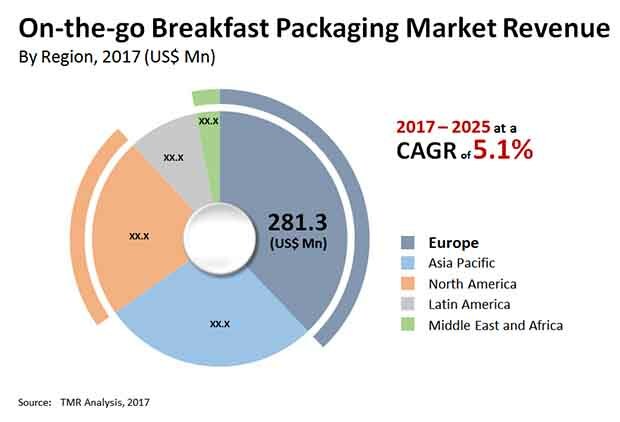 The worldwide on-the-go breakfast packaging market is portrayed by a high level of fragmentation with an extensive number of little and medium-sized organizations, which renders an extreme aggressive situation. To survive the ferocious competition, sagacious players are occupied with expanding their item portfolio go for a solitary item to take into account the diverse necessities of consumers. The worldwide on-the-go breakfast packaging market is isolated into unbending packaging and adaptable packaging in light of packaging sort. The section of adaptable packaging represents significant share in the market. The main consideration driving the adaptable packaging portion is consumer inclination for convenient packaging solutions. The fast paced lifestyles and expanding working ladies population has delivered interest for on the go breakfast. Changing way of life and urbanization are development drivers for on the go breakfast market. They give favorable position, for example, simple taking care of, capacity, preservation, and simple consumption. On the go breakfast has convenient pressing, which can be consumed while voyaging or at work. Growing awareness about nutrition amongst the consumers has prompted popularity for nutritious on the go breakfast items, for example, breakfast oats. On the go breakfast market is a convenient option for the working population, as they give simple and prepared to have breakfast. It incorporates breakfast foods, for example, oats, prepared sustenance, shakes, and smoothies. The key players are propelling different items with inventive packaging and ads, attributable to the interest for on the go breakfast. Furthermore, they are embracing systems, for example, merger and acquisition to further lift the business. A case of acquisition is the acquisition of Weetabix Limited by Post Holdings in July 2017. Another factor catalyzing development of the on-the-go breakfast packaging market is the rising pattern of vast number of single persons moving out of home for work reasons. Because of time crunch they don't get much time to plan first supper of the day, which is fueling the interest for arranged breakfast options and in a roundabout way profiting the on-the-go breakfast packaging over the years to come. In 2017, The Kellogg Company included 50 new breakfast and nibble items to their item portfolio for brands, for example, Special K and Frosted Flakes. This is relied upon to have a noteworthy positive effect on the development of the market. From a geological point of view, Europe best the worldwide on-the-go breakfast packaging market as far as piece of the overall industry. The matchless quality of the region is on the back of a huge urban population and an expansive number of ladies in the workforce that consume arranged sustenances for convenience. Be that as it may, Asia Pacific is relied upon to show the main CAGR of 5.3% for the estimate time frame in the vicinity of 2017 and 2025. An expansive proportion of population in working age in creating nations, for example, India that incline toward consuming on-the-go breakfast is the key factor behind the powerful development of this regional market. Sealed Air Corporation, Tetra Pak International S.A, Clondalkin Group Holdings B.V., Reynolds Group Holdings Ltd, Coveris Holdings S.A, WestRock Company, Smurfit Kappa Group Plc, Winpak Ltd., Constantia Flexibles Group GmbH, Ampac Holdings LLC, International Paper Company, DS Smith plc, Georgia-Pacific LLC, Amcor Limited, Mondi Group and Sonoco Products Company are some of the significant names of the global on-the-go breakfast packaging market.